Hawaii’s state flower is the yellow hibiscus. The large flowers are four to six inches in diameter and often have a maroon-colored center. The flowers seem to open and close at certain times each day. Bright, cheery and oh so photogenic, it’s worth taking a moment to stop and smell the flowers when you stumble upon yellow hibiscus in Hawaii. 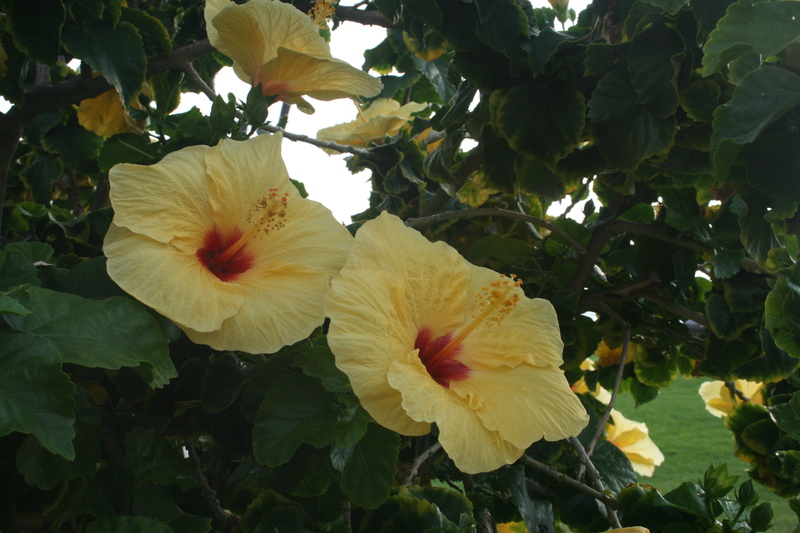 This entry was posted in Flowers, Hawaii, Travel, Uncategorized and tagged Hawaii, Hawaiian floral and fauna, Hawaiian Islands, hibiscus, state flower, yellow hibiscus by alohajournal. Bookmark the permalink. I brought a slip back from my trip to Kauai and just planted it. We’ll see if I can make Hawaii come alive in Minnesota! Please keep me posted! We could use some cheery, tropical flowers in Minnesota after our winter and this chilly spring.